Einladung zum 2. 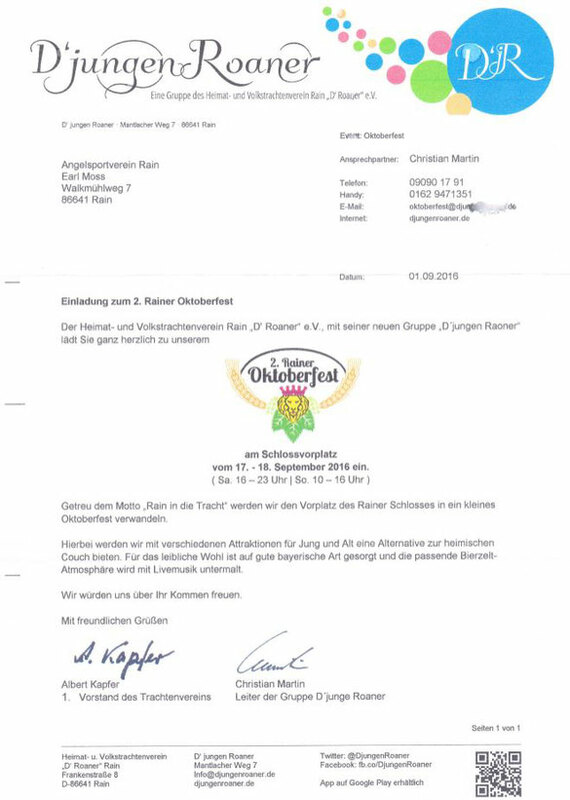 Rainer Oktoberfest - Angelsportverein Rain am Lech e.V. Excellent way of describing, and nice piece of writing to take facts on the topic of my presentation subject, which i am going to convey in university. I used to be recommended this website via my cousin. I'm not certain whether this submit is written by way of him as nobody else understand such distinctive about my difficulty. You are wonderful! Thank you! I do not even know the way I stopped up here, however I thought this post was great. I do not realize who you're however certainly you are going to a well-known blogger if you happen to are not already. Cheers! Howdy, i read your blog occasionally and i own a similar one and i was just wondering if you get a lot of spam comments? If so how do you reduce it, any plugin or anything you can suggest? I get so much lately it's driving me crazy so any assistance is very much appreciated. Wow, that's what I was seeking for, what a stuff! existing here at this webpage, thanks admin of this web site.